This weekend in need of stretching our legs and eyes we headed off to an amazing local historical site Castle Ring, the highest point on Cannock Chase. This Iron Age hill fort is about 240 metres above sea level and has spectacular views, especially on a clear bright day like this Saturday. After walking the circuit of the monument we stumbled down steep tracks into the heart of the woods and eventually panted our way back up. So glad we cancelled that gym membership! The peace of the countryside made for a couple of hours of pure escapism. The stillness of the air and the bright skies added to the aura of mystery. We spotted this crow several times and he seemed to be keeping guard of the monument right here at the top of these steps. The top of Castle Ring is open grassland which although very boggy looked stunning as it was bathed in golden light. Note the mud seeping up the legs of my jeans. Today we ventured south to St. Albans for a quiet family celebration, my brother's 50th. Family gatherings are the best. A great spread, Grandpa playing Buzz on Playstation with his grandchildren and homemade cake. A great weekend even if we did have to drive back home through pouring rain. Sounds like a fabulous weekend. 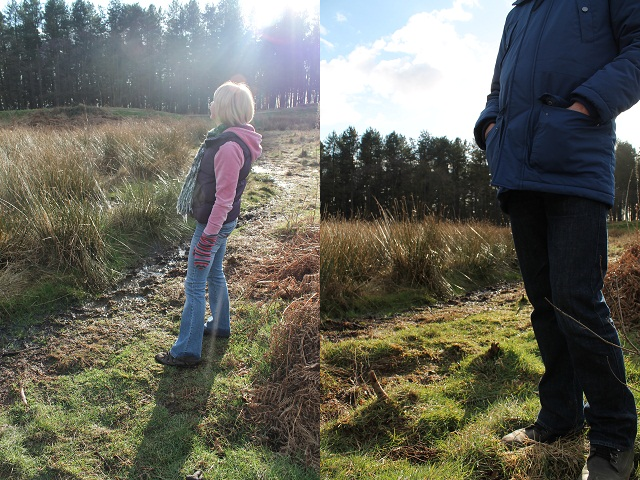 I do love a good hike around Cannock Chase, clears the cobwebs out. I'm not a Playstation fan; don't want my little babe to get into that. But that is a great picture of the multiple generations playing together! Being active in nature is much better than walking inside on a treadmill, staring at a screen. Looks like a chilly hike.